To fully appreciate Dan Henry watch designs, it’s helpful to understand the motivation behind the man. At the age of 10, Dan received a Roskopf pocket watch for his birthday. That piece fired his imagination for all things mechanical, and would eventually lead to a watch collecting hobby (or habit). Dan scoured local flea markets, antique shops, and eventually the Internet for rare and historically significant pieces. After building up an incredible, and frankly awe-inspiring collection of over 1500 pieces, Dan felt that he needed to share his passion with others, so he signed up for an Instagram account and started posting. This lead to the creation of what I would consider one of the most significant online timepiece research sites on the Internet, timeline.watch. I’ve spent countless hours poring over the incredible data Dan presents on the site, discovering watches I never knew existed. Timeline.watch is one of just a small handful of sites that has helped to fire my own passion for the hobby. While Dan thoroughly enjoyed sharing his passion and his collection with the world, what he really wanted to do was allow others to experience these pieces firsthand. With that, Dan Henry Watches was born. Dan’s pieces are not designed as homages to a single historical piece, but are meant to capture the spirit and design aesthetic of a specific point in time. Most importantly, they’re built to a price point that’s attainable for just about anyone who loves watches. 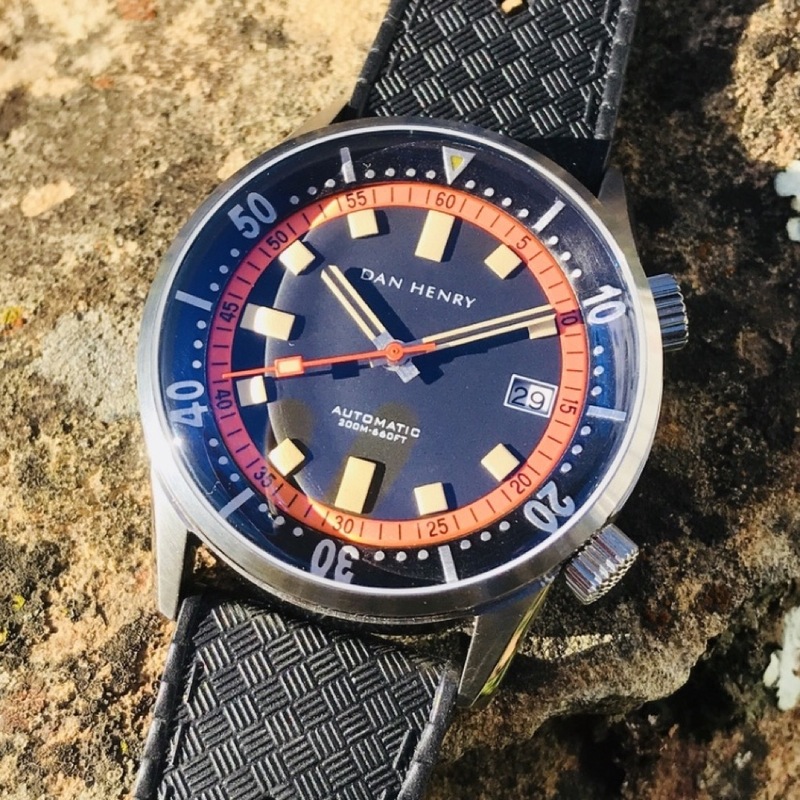 With that in mind, let’s take a closer look at the Dan Henry 1970 Automatic Diver. Dan names all of his pieces after the time period in which he draws his design inspiration. In this case, the 1970 evokes a time of bright colors and slightly offbeat design. The primary inspiration from the piece comes from the early compressor style dive watches of the time. You’ll find inspiration in the 1970 from the likes of Seiko, Bulova, Breitling, Longines, and a dozen others. But, if you’ve perused Dan’s collection at length, you’ll find a piece that the 1970 very closely resembles, that being the 1967 Exactus Super Compressor. Originally released in a hefty 44mm size, we’ll be taking a look at the 40mm version of the 1970 released in 2017 to satisfy the many enthusiasts who prefer a smaller footprint on the wrist. The watch arrives on a tropic rubber strap, is tucked inside a 3-watch canvas watch roll which is further protected in a hard plastic two-piece cylinder. I really like this presentation, and have used the watch roll and plastic carrying case to transport other pieces on several occasions. Not being a huge fan of rubber straps, which tend to pull on the hair of my Sasquatch-like arms, I quickly swapped it out for a basic black 3-ring nylon Zulu. At a flyweight 65 grams, the watch is easily held in place by any strap the owner prefers. After a few minutes I literally forgot I was wearing a watch because it was so light and comfortable. The compressor-style stainless steel case is a simple round affair with brushed sides, punctuated in steeply sloping lugs that allow the watch to hug the wrist nicely. The lugs themselves are cut on three angles, with the centermost angle being polished and the two opposing angles wearing a brushed finish. This attention to detail adds an elegant touch to the piece. The bezel has a narrow 2mm, vertically polished surface, turning in to meet the double domed, “sapphire and AR coated” mineral crystal at a 45 degree angle. The thin bezel accentuates the dial and makes the watch look bigger than its 40mm case size since it’s basically all dial. The screw-on case back treats the wearer to a cool polished engraving of an octopus wearing a classic diving bell helmet (designed by Dan’s wife). The knurled crown at 2 o’clock controls the inner rotating bezel, while the matching screw-down crown at four handles winding and setting functionality. Instead of being signed, the crowns feature crosshatch engraving. On the flat black dial we find “Dan Henry” taking point under the rectangular, applied 12 o’clock index, with “Automatic” and “200M – 660FT” taking up the space between dial center and the similar 6 o’clock index. The 9 o’clock index is sized to match the 6 and 12, while the remaining hour makers are smaller boxes. The date window replaces the 3 o’clock index and is nicely framed in white. It would have been nice to see a white-on-black date wheel to better blend with the overall look of the dial, but at this price point it’s tough to fault the choice to stay with the standard black-on-white wheel. All indices are filled with a vintage lume fitting the time period. The hour and minute hands are basic batons with the ends snipped at 45 degrees and two strips of luminescent material framing a black line down the center. The orange seconds hand sports a lume filled rectangle about two thirds of the way along its length. After just a few days of wear, I unfortunately experienced a badly cracked crystal on the 1970 related to a manufacturing issue in the first run of 40mm pieces (issue has since been resolved in subsequent runs). A quick email to Dan Henry to explain the situation and find out where to send the piece for repair resulted in a brand new watch showing up on the doorstep just four days later. Dan readily admits that his pieces are built to a specific price point, and is quick to replace a broken or defective piece, no questions asked. This commitment to customer service is, unfortunately, rarely found in this day and age, and Dan should be applauded for his approach to customer satisfaction. Would I buy one for myself based on what I’ve seen? Yep, I sure would, and did. What spoke to me the most about this watch: The vintage feel, the great mix of colors, and the affordable price point. Up until recently I was a prolific collector of watches of all shapes and sizes, and an obsessive reader of all the major watch blogs and forums. Now, I’m sure much to the regret of John, Patrick, Victor, and the rest of the contributors here on WWR, I have the privilege of writing my own reviews for other watch geeks to read. Hope you enjoy what I have to say, and if you don't, that's perfectly ok too! You can also find me on Instagram at @ranchracer.